The SIMWOOD final conference was held at the Engineering School of Paris on 12-13 October 2017. The conference gathered together stakeholders, policy makers, SMEs and academics. 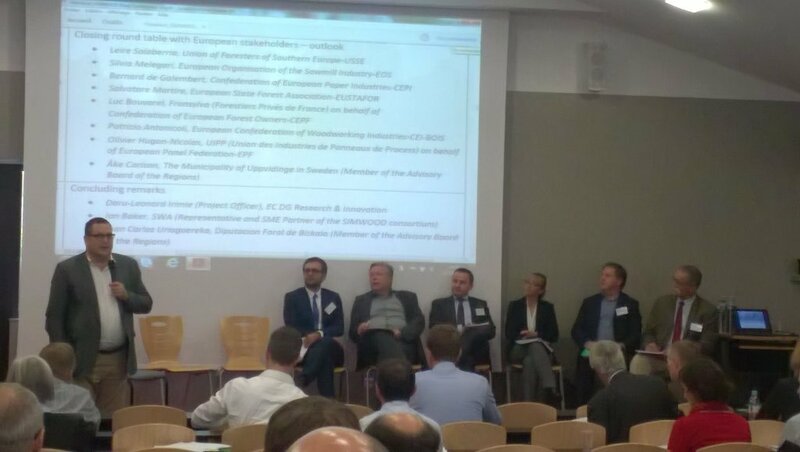 The SIMWOOD project aimed to increase the mobilisation of wood from forests and woodlands in Europe. The project reaches out to stakeholders and regional initiatives with the aim of engaging and mobilising forest owners and practitioners, promoting collaborative forest management and ensuring sustainable forest functions. SIMWOOD is a four-year EU FP7-KBBE collaborative project, with a total budget of 7.5 million euros. The European Commission contribution is 5.9 million euros. The project runs from November 2013 until October 2017. The project consortium includes 27 partners from 11 European countries. Salvatore Martire, on behalf of the EUSTAFOR Executive Office, took part in the concluding panel discussion highlighting the main issues in relation to wood mobilization from a state forest perspective, and discussing how SIMWOOD results and follow-up can be beneficial for the EU Policy debate in relation to climate and energy and the bioeconomy. EUSTAFOR inputs for the discussion have been based on a recent survey within EUSTAFOR collecting replies from EUSTAFOR members (Austria/ÖBf, Finland/Metsahallitus, France/ONF, Latvia/LVM, Slovakia/LSR, Sveaskog/Sweden) on the topic as well as on the recent EU Policy developments and related EUSTAFOR’s positions.